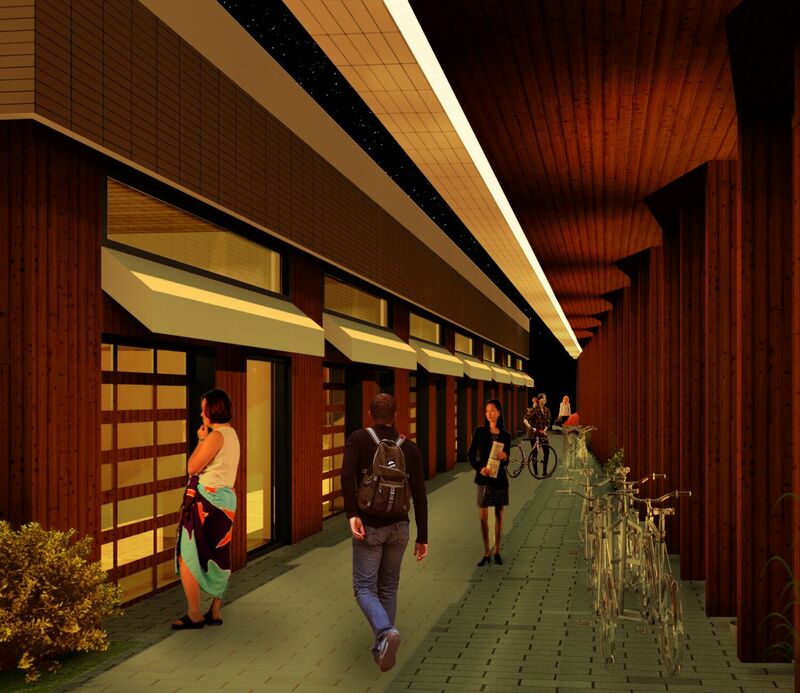 The Canyons will include a Japanese style alley running through the site, where the public can past eleven live/work spaces with storefronts, intended to include essential services for seniors, workspaces for artisans, and other small businesses. The Oregonian confirmed that Seattle-based developer Vibrant Cities plans to build a Hyatt Place branded hotel in the Pearl District. The Esco site in NW Portland has sold to a consortium of developers — not including the group behind the Portland Diamond Project, writes the Oregonian. The New York Times covered Heartline, the Pearl District building that “serves to unite the two halves of the surrounding neighborhood“. Portland Monthly wrote about The Canyons, new housing concept on N Williams that “aims to change how some Portlanders age“. The Portland Tribune reported that renovation costs for the shelter at 6144 SE Foster Rd have increased by $1 million. This entry was posted in 6144 SE Foster, ESCO Redevelopment, Heartline (Block 136), Hyatt Place, Portland Diamond Project, The Canyons, weekly roundup. Bookmark the permalink. I love how so many places build these “places” that never actually materialize. I highly doubt that “Japanese style alley” will ever be anything. People act they way they do and that doesn’t change because a building is designed different. Billyjo, there are numerous case studies that prove your uneducated point of view incorrect. And there are many, many buildings that prove me right. There’s always a vibrant courtyard that in drawings looks to be the center of a thriving community, when the building gets built, the courtyard sits with no life. Maybe if you stopped relying on what you were “taught” and instead looked at the world around you, you might see that what you’re taught isn’t always the only way, or even the best way. Calling someone with a different point of view than you “uneducated” says far more about you than anything else. Honestly, I learned more in the first 5 years I was out of school than I learned in the 5 years I was in school. Reality has a way of being far different than what is taught. Companies do research and studies before committing to huge projects. That doesn’t mean that the project is gonna work. Many on paper look like a slam dunk but in reality never work out. How many buildings get built and years later still sit under utilized and failed? It happens. Case study or not. Go ahead and design the building you want and expect people to figure out how to use it. Nothing’s stopping you, but don’t be shocked if people don’t respond well to it. If people aren’t using your designs (or more likely based on your lack of experience, your superior’s designs) the way that you were originally intending then you should be making records of that to use in future projects. You could also research previous case study projects to see how similar spaces or project typologies get used. Or I guess you could just complain on the internet how your projects aren’t successful, but conveniently miss the point that maybe it’s not the user’s fault for their lack of success, it’s the designer’s.